September 11, 1893: The World’s Parliament of Religions opened in Chicago. I’ve written quite a bit about the Parliament in past articles, and you can read all of them by clicking here. The super-short version: In conjunction with the Chicago World’s Fair, representatives from every major world religion convened in Chicago for the mother of all ecumenical gatherings. Among the most impressive figures at the event was a Greek Orthodox archbishop, Dionysius Latas of Zante, one of the best known hierarchs in the Church of Greece. Archbishop Dionysius attracted a lot of press, but the most interesting Orthodox figure at the Parliament was Fr. Christopher Jabara, an Antiochian archimandrite who rejected the doctrine of the Holy Trinity and wanted to create a single world religion. To read more about Jabara, click here. September 10, 1900: Nicholas Bjerring died in New York. Bjerring had converted from Roman Catholicism to Orthodoxy in 1870. He was immediately ordained a priest in Russia and sent back to America to establish the first Orthodox chapel in New York City. Bjerring’s chapel was one of only three Orthodox houses of worship in the contiguous United States (the others being in San Francisco and New Orleans). And while there was a Russian bishop living in California, Bjerring and his chapel were directly under the Metropolitan of St. Petersburg. Things didn’t work out all that well. After sputtering along for 13 years, the chapel was closed by the Russian government, and a disenchanted Bjerring converted to Presbyterianism. A few years before he died, Bjerring re-converted to Roman Catholicism, as a layman. September 12, 1912: Fr. Demetrios Petrides arrived in Atlanta to become the priest of Annunciation Greek Orthodox Church. Petrides had been in Philadelphia, where he clashed with a rich Greek tobacco magnate. It’s a crazy story — the millionaire layman wanted Petrides to bow to him and follow his every order, and Petrides flatly refused. The rich guy got Petrides fired from the parish (that was how things worked back then), and Petrides moved to Atlanta. One newspaper dubbed him the “stormy petrel of the cloth,” and he continued his distinguished career until his untimely death from diabetes in 1917. Another interesting aspect of Petrides’ career is that he was the priest who recommended that the Ecumenical Patriarchate ordain Fr. Raphael Morgan, who became the first black Orthodox priest in America. For a time, Morgan — who had a troubled marriage that ended in divorce — actually lived in Petrides’ house. September 13, 1921: Two big events on this day: the birth of Fr. Alexander Schmemann, and the opening of the first Clergy-Laity Congress of the Greek Archdiocese. The Clergy-Laity Congress accomplished the legal incorporation of the Archdiocese, and many date the beginning of the GOA to this date. It’s sort of arbitrary, though — you could pick any number of dates between 1918 and 1922. I think the Congress itself, rather than the act of legal incorporation, is ultimately more historically significant. As for Fr. Alexander Schmemann, he was one of the most famous and important figures in late 20th century American Orthodoxy. What did he do? What didn’t he do? He’s probably best known for his writings — seminal works like For the Life of the World, The Eucharist, Great Lent, and many, many more. Or maybe he’s best known as a professor and longtime dean of St. Vladimir’s Seminary, where he educated hundreds of future church leaders. Or perhaps it’s his role as a churchman: he played a key role in the establishment of the OCA, and the founding of SCOBA. He attended Vatican II as an observer, and he advised the Evangelical Orthodox Church on its path to conversion to Orthodoxy. After the death of Metropolitan Leonty in 1965, the Metropolia/OCA lacked a dominant hierarchical presence. Schmemann, a married priest, filled that role, and was for the OCA what Archbishop Iakovos was to the Greek Archdiocese, and Metropolitan Philip Saliba was for the Antiochians. September 11, 1927: Fr. Emmanual Abo-Hatab, former archdeacon to St. Raphael Hawaweeny, was consecrated a bishop for the newly established American Orthodox Catholic Church. The AOCC was led by Archbishop Aftimios Ofiesh, and it was fringe from the beginning. Bishop Emmanuel eventually split from Aftimios and went to the Russian Metropolia, where he succeeded Aftimos as leader of the “Russy” (pro-Russian) faction of the Arab Orthodox in America. Mrs. Roosevelt said that the members of the Greek congregations had expressed their worship of God by means of beautiful edifices erected in this city. She added the hope that their fine spirit would be carried on by the new members of these congregations. Members of the Holy Trinity congregation, whose church was destroyed by fire several years ago, and those of the congregation of the Church Evangelismos [Annunciation] will be amalgamated into one congregation in the new edifice which is expected to be completed in April at a cost of $600,000. $600 grand in 1931 is equivalent to roughly $8.5 million today — a decent chunk of change in any era, but particularly during the Great Depression. September 10, 1933: Fr. 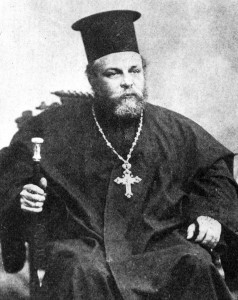 Benjamin Basalyga was consecrated a bishop in Pittsburgh, for the Russian Metropolia. The 46-year-old bishop was born in a Pennsylvania coal town, and as a child, he was one of the first students at the Russian missionary school in Minneapolis and then at the Minneapolis seminary. Later, he became a hieromonk and served in parishes all over America and Canada, without spending much time in any particular community. For a while in the 1920s, he was the personal secretary to Metropolitan Platon, head of the Russian Metropolia. After being consecrated, Benjamin served as Bishop of Pittsburgh for about a dozen years, after which he led the Orthodox Church of Japan from 1946 to 1953. He then returned to his see in Pittsburgh for another decade before his death in 1963. September 11, 1948: Bishop Alexis Panteleyev (or Panteleev), the Russian Metropolia’s Bishop of Alaska, died. I know next to nothing about Bishop Alexis, but I can tell you that he was originally consecrated Bishop of San Francisco in 1927, and served in that post until 1931. In 1934, he became the Bishop of Alaska. Then, in 1945, he was sent by the Metropolia to attend the enthronement of Alexei I, the newly elected Patriarch of Moscow. In this period, there was some hope that Moscow and the Metropolia could reestablish communion. As it turned out, the Metropolia couldn’t accept Moscow’s terms, and reunion didn’t happen. The next year, though, Bishop Alexis decided to join Moscow himself. He explained his reasoning in this way: “In order to be in unity with the Eastern Orthodox Church, it is necessary for the Russian Orthodox clergy to be under the Patriarch of Moscow.” (New York Times, 4/20/1946) Bishop Alexis died two years later, in 1948. September 16, 1949: St. John Maximovitch, then the ROCOR Bishop of Shanghai, spoke before the United States Congress. This article is getting a bit long, and St. John’s visit to Congress is really interesting, so I think I’ll save this one for another day. September 14, 1951: Fr. Demetrios Makris was consecrated a bishop for the Greek Archdiocese, with the title “Bishop of Olympus” (yes, that Olympus). This was back when the GOA had a single Archdiocese composed of a series of “Archdiocesan Districts,” each overseen by a titular bishop but ultimately answerable to the Greek Archbishop. Later, those Districts became Dioceses (and their leaders diocesan bishops), and today they’re Metropolises with Metropolitans. Anyway, Bishop Demetrios was initially assigned to the massive First Archdiocesan District, which included New York, New Jersey, Pennsylvania, Washington DC, and more. Later, he headed up the Districts based in San Francisco and then Boston. To be honest, I know even less about Bishop Demetrios than I do about Bishop Alexis Panteleyev (above). I’m not even sure when he died, though I’d guess it was in the 1970s (his tenure in Boston ended in 1973). If anyone out there can fill us in, please do. That’s it for this week. Thanks for reading, and for your patience during this period of irregular output here at SOCHA.